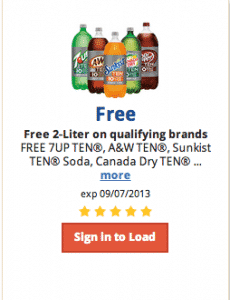 Click here to visit the Kroger site, then click the “Beverages” category and you should be able to spot the coupon above good for a free 2-liter soda. Click it and either register a new account or signin for it to be loaded onto your card. The coupon is available to load onto your card today only, but you have until 9/7 to actually use it. This is still available(or at least it is on the west coast),I just loaded it to my card 5 minutes ago,with no problems.